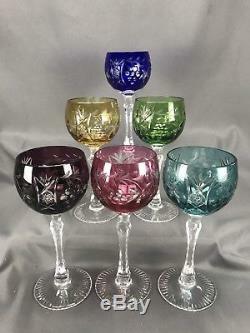 The glasses are cased in multicolored glass and cut to clear in Ajka's Marsala pattern. There are no chips cracks or repairs. 2 1/2 wide at the mouth. Each glass is about a pound. Due to item manufacturing date normal wear is to be assumed given the age. We consider pot stones, crazing, and kiln spots as such. Please see photographs for further indication of the condition of the items you are purchasing. Charlie's China considers photographs to be a part of the description of the item. The item "(6) Multicolor Ajka Marsala 7 7/8 Crystal Star & Grapes Cut To Clear Wine Hocks" is in sale since Tuesday, September 26, 2017. This item is in the category "Pottery & Glass\Glass\Art Glass\Bohemian/Czech\Other Bohemian/Czech Art Glass". The seller is "charlieschina" and is located in Newport News, Virginia. This item can be shipped worldwide.